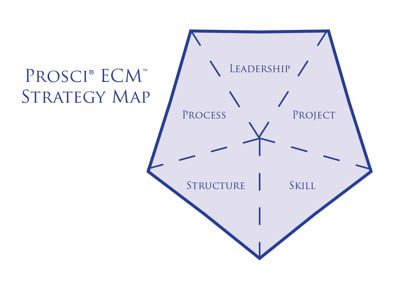 Following the business case outline created by Prosci, you can present the rationale and approach for building an organizational change management capability—what we call Project ECM™ (Enterprise Change Management) in a structured and formal business case. This is not an exhaustive presentation of the business case but will instead give a glimpse of how you could position organizational change management capability to senior leaders in the format of a business case. In the coming years, no core competency will be more important than the ability to effectively implement change. With increasing internal and external pressures, our organization will only undertake more projects and initiatives. Our ability to achieve expected benefits and outcomes will be tied directly to how effectively we engage employees in these upcoming changes, as return on investment depends on employee adoption and usage. By building an organizational change management capability with the ECM Project, we will realize greater return on the initiatives we launch and position ourselves for success in the present and the future. The time to build an organizational capability in change management is now. In upcoming years, we will face more change than ever before. We are already suffering the consequences of change saturation, and a change management capability can help increase our capacity to handle new change. Industry data suggests that 70% of change initiatives fail to deliver. One key source of this failure is that we do not pay adequate attention to employee adoption and usage. We have experienced the costs of not managing change and cannot afford to put at risk the changes we are about to embark upon. Additionally, data suggests that there is a direct correlation between project success rates and effective change management. 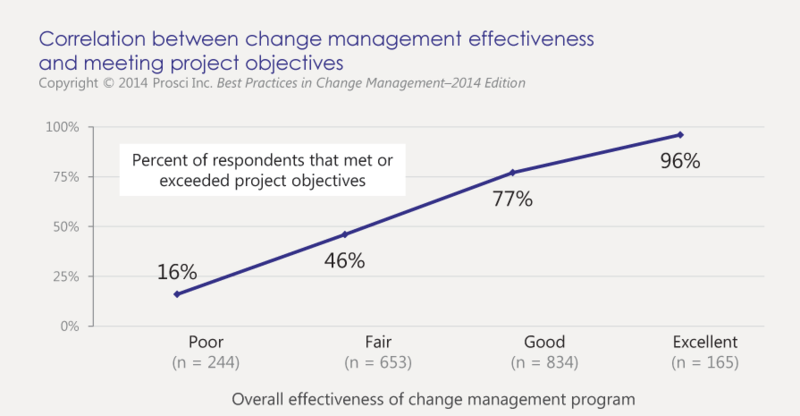 Projects with excellent change management are six times more likely to meet objectives than those with poor change management (see below), and they are more likely to be completed on time and on budget as well. 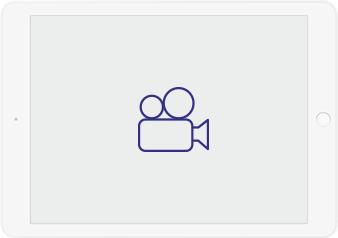 As an organization that values our employees and considers them one of our most important assets, it is paramount that we embed an employee focus in our change efforts. Our ability as an organization to realize benefits and create value through change depends on our internal change management capabilities. The objective of Project ECM is to improve our organizational maturity in change management, increase our change capability and improve the success rates of our projects and initiatives. Allocating budget and resources for change management on each project and initiative. While the cost figure may seem large at first glance, it is quite small when compared to the overall capital and budget being invested in projects and initiatives; a Prosci site license equates to a rounding error on our largest project. We will strategically select specific pilot projects. These projects will have fully resourced and budgeted change management, including training for the project teams and impacted leaders, managers and supervisors. Additionally, we will begin work to develop internal trainers and to procure the necessary Prosci site license to fully integrate change management into the project management methodology and other improvement disciplines. We will increase the number of projects applying change management, build out a robust curriculum so that change leadership becomes a competency of all members of the organization (even weaving change management concepts into existing leadership development programs), and integrate change management into the project management methodology and other improvement disciplines. In addition, we will create and charter a Change Management Office. During Phase 3, we will extend change management to all projects and initiatives and will include change management in the project launch and funding processes. The Change Management Office will be fully functional and will support the application of change management and the building of individual change management competencies. We will also deliver training to all employees, along with continuous education opportunities, and we will add change leadership to the performance management system. A specific timeline with dates will be built around the three phases. The primary critical assumption is that this effort will have the necessary and sufficient support by senior leaders. The effort will not be successful if change management is seen as optional. The effort must have senior leaders demonstrating their commitment to building an organizational capability. This support must be active, visible and sustained for the effort to gain the necessary traction and momentum. A primary risk to the effort would be attempting to create an organizational capability simply through training. It is necessary but not sufficient to train members of the organization in change management. However, change management must also be attached to projects, and its impact must be made visible. It must become commonplace and viewed as a "must have" rather than a "nice to have." To achieve this, we must integrate change management in how projects are governed, including funding decisions, progress reviews, measurements, and resourcing and budgeting exercises. Project leaders must know that their sponsors expect change management on each initiative they fund. Building an organizational capability in change management is not free, will not happen overnight and will take energy and commitment. However, with the velocity of change and the importance of realizing expected benefits from the numerous projects and initiatives our organization is undertaking, it is an essential move that we must make. To begin, we suggest formally chartering Project Enterprise Change Management, assigning an Enterprise Change Management lead and creating a team or task force to begin developing the solutions and plans that will increase our adaptability, agility and change capability. Presenting a formal business case for change management to a project leader or senior leader can earn you the resources and time needed to properly implement change management. In this session we will review how to create an effective argument for change management.